The idea is simple; fly to Istanbul and then travel back to Bristol by train. 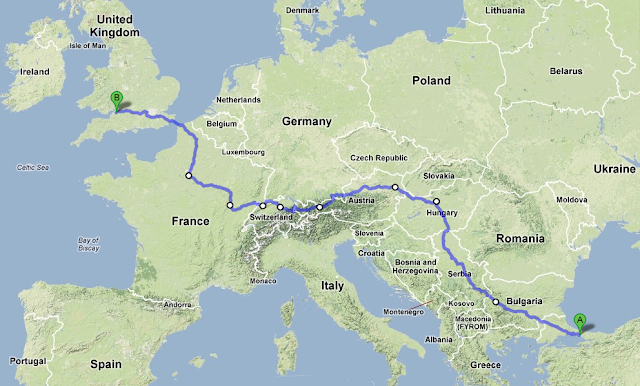 My 3700 kilometre route should take me through Turkey, Bulgaria, Serbia, Hungary, Austria, Switzerland, France and finally back to Britain. I love travelling, seeing the world roll by, the kilometres counting out the changes in peoples, beliefs, countries and cultures. In two weeks there is no chance of grasping anything but a small fraction of the history and people covered by my route, but even that small fraction will be fascinating. On this holiday I hope to see the transition from eastern to western influence. Starting in the former Ottoman capital of Istanbul (then Constantinople) on the very edge of Asia, travelling through the evolving Balkans and into Western Europe via the remains of the Austro-Hungarian empire, with Vienna acting as the westward limit of former Ottoman control. I'm writing these posts after my return but will be post-dating them to match the dates when I was underway to create a more logical order. While on holiday I wanted to focus on enjoying my time travelling, so I stuck to making simple notes with old fashioned pen and paper, and saved the write up for later when I can enjoy reliving what I saw.